This crucial program, developed in Canada for Canadian parents of every cultural community, has been consistently demonstrated to positively impact the parenting knowledge, skills and confidence of participants. For parents in particularly stressful situations—when there simply isn’t enough money, when they’re new to the community or to the country, when they’re young, or under-educated, or struggling without a partner or family support—being part of a supportive group of parents who understand and share their difficulties can make all the difference. 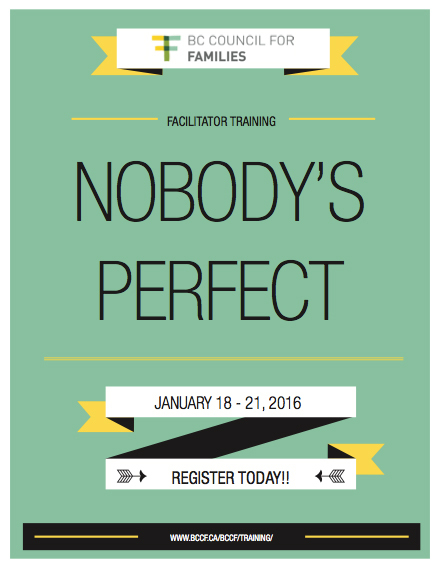 Looking for more information about the training visit the Nobody's Perfect page. Guest room rates start at: $116 per night plus taxes. Call hotel at (604) 689-8033 to book a guest room. Special room rates available for a limited time and limited quantity.